Super Mario Run’s launch on December 15th was perhaps the biggest mobile release since the invention of the App Store. Announced during Apple’s iPhone 7 keynote, Nintendo finally decided to bring one of the most lovable brands of all time to mobile. Despite the major splash it made topping the Top Free and Top Grossing charts during its first day out, an outstanding portion of reviews (57% according to Sensor Tower) gave the game just 1 star. This ties for the poorest rated game within the top 100 grossing games in the App Store. This is not going unnoticed among investors, and Nintendo’s stock price dipped significantly (13% at publication of this article). As a case study for mega game companies and brands, it’s important to learn why the app reviews are so low. 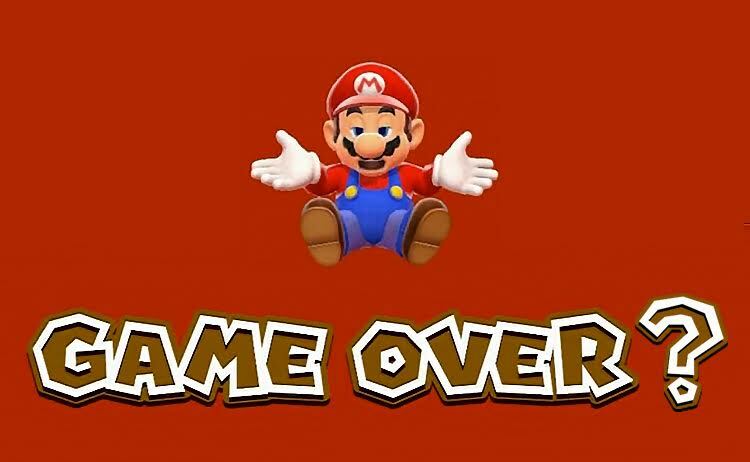 Perhaps if investors and developers understood the implications of poor reviews on the economy of a game like Mario, they would be more optimistic about its chances to succeed. Obviously, great app reviews are testimony that people love playing your game to the extent that they are willing to invest time in writing a recommendation. Although it’s impossible to know exactly how Apple ranks apps in search results, it’s plausible that they take ratings into consideration since they ultimately care for the experience of device owners. Since an ample amount of downloads come from search, this can be key to driving organic growth. 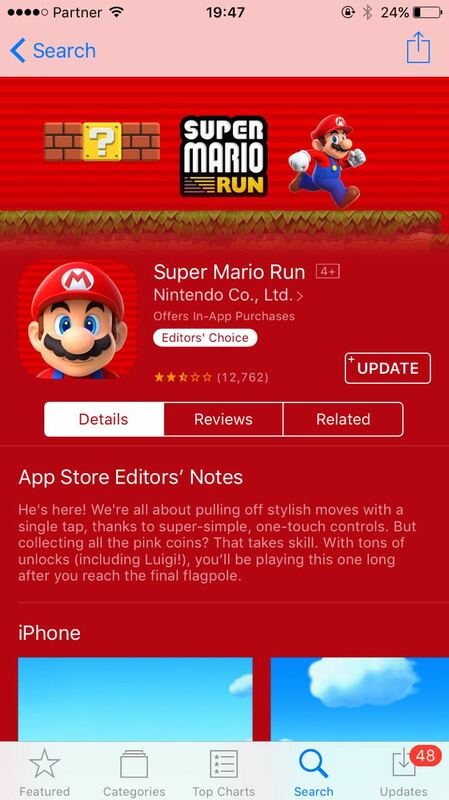 For the time being, this has zero to little impact on Mario’s awareness in the App Store. Thanks to Apple’s generous promotion in the App Store’s featured tab, the first feature you see as you enter the store is a banner directing you to download the game – driving discovery to the fullest and giving it Apple’s quality stamp of approval. Getting discovered is a major challenge for most developers, and ranking high for the right keywords is vital for that. But as noted above, for mega IPs such as Mario, awareness is hardly an issue since a widespread audience is familiar with the brand and knows how to search for it. The major challenge for games that leverage top notch licenses is making sure visitors that have discovered the game actually download it. Based on our research on App Store engagement of over 50 million users, we found that app reviews can make a significant impact on conversion rates, especially as you close the gap from 2-4. Having said that, there’s a major exception when analyzing the impact of app reviews on branded games. For the most part, visitors first choose to learn about the app through screenshots and video, and only once they feel informed enough do they check reviews to see if the app’s claims are backed by users. In this case, despite the low review rating, the attractiveness of the game paired with the powerful featuring by Apple and overall Mario madness is probably enough to maintain high conversion rates and overcome any negative impact potentially caused by bad reviews. Don’t get me wrong! In the long run, poor reviews will hurt since it could be a sign that people don’t like the game. However, reading just a handful of negative reviews reveals that users are mostly frustrated by that fact that Mario isn’t your standard “Free to Play” game. Instead, Nintendo just allows you to demo 3 levels and then requires users to pay $10 to unlock the entire game – a sum considered very hefty for a mobile game. Trying out this unusual business model is a very bold move by Nintendo, and was likely employed to eliminate concern by parents that their children would spend much more on in-app purchases than the initial $10 all-inclusive fee. Was it smart? It’s too early to tell, but Nintendo has a longer term strategy to capture a relatively younger audience, shift them to their own hardware devices, and ensure the longevity of one of the oldest breathing brands in gaming. Personally, I’m cautiously optimistic. I believe that as word spreads about the $10 fee and Nintendo communicates this better, players won’t be caught by surprise as they hit the paywall. As a result, player reviews will be more forgiving and focus on the overall fantastic gameplay. More importantly, I’m hopeful the game succeeds financially so it opens doors for new entrants to the market (easier to calculate CAC and LTV) and can introduce better game design that optimizes for player delight as opposed to LTV. Adam is the co-founder of StoreMaven, having previously founded Shaker (and winning TechCrunch Disrupt in 2011). Adam copied that first line from co-founder Gad, but it is in fact true for him as well. Amidst a sea of techies, Adam translates code to dollars and specs to business models. As the most social Maven, Adam has probably spoken to you at one point or another, and you may remember him from his heavily-styled hair or hole-riddled t-shirt. When not denying his emo-hipster essence, Adam likes playing soccer, reading every article about mobile ever, and stealing everyone else's chargers. How Much Should You Rely on Google Play Store Listing Experiments? Receive The Latest ASO News Enter your email below to receive the latest ASO news and updates straight to your inbox.